One of the events in the Annual Sports and Cultural Meet of Sai Institutions which is mandatory for every student is the March Past. 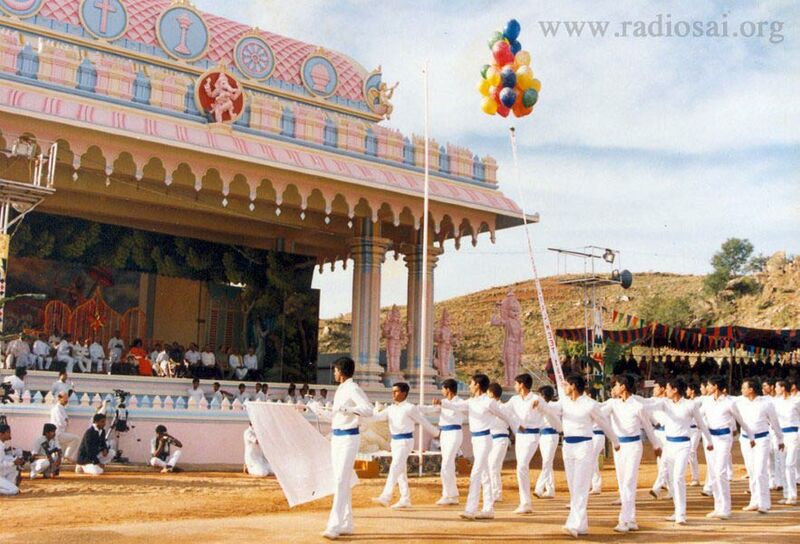 Every January 11 programme began with this drill and it always had complete attention of Bhagawan. Not only on the day of the event but from the time rehearsals of this began on the ground. In fact the rehearsals would begin in many years with His reminders! 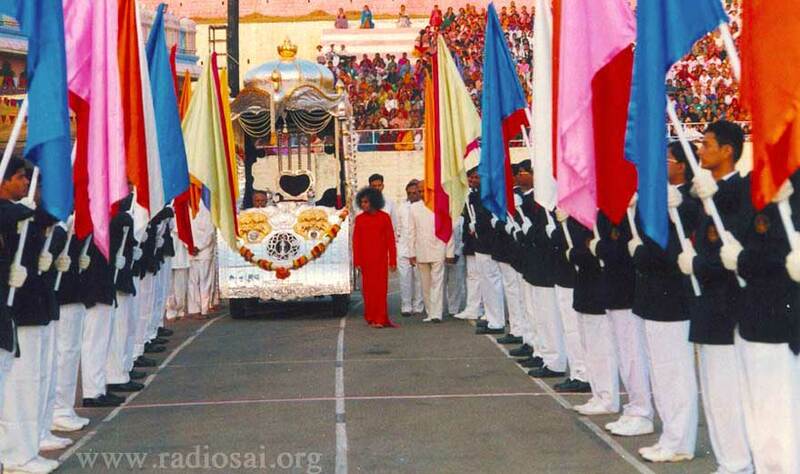 Why is the March Past so dear to Bhagawan? What were His directions? Why was it mandatory for all? S. Srinidhi, an alumnus of Baba's university, who has been serving in the Armed Forces for 15 years now since he completed his Masters in Financial Management in Puttaparthi in 1999, shares his insights about this special event of every Sportsmeet. 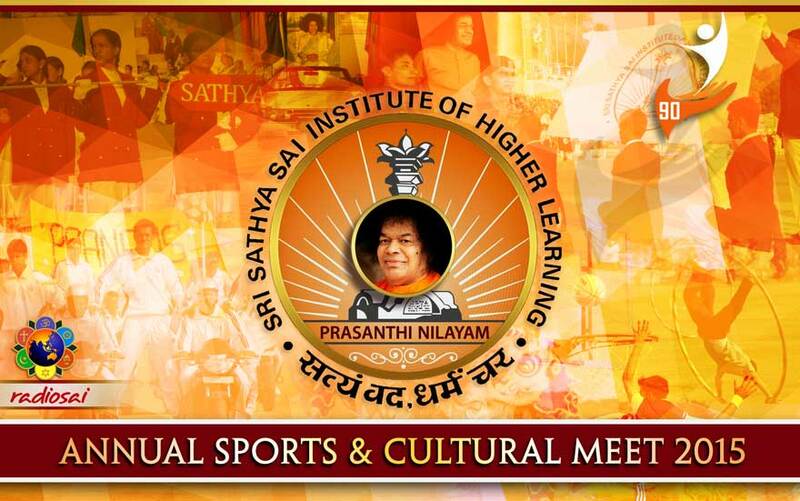 Bishu Prusty (BP): Sairam brother, it is our privilege speaking to you because you are one of those alumni of Bhagawan's University who comes back every year during the time of Sports Meet. You have been doing this for six years now. Even though you are in the Armed Forces, you always manage to take a long break during this time and stay here from Christmas till the Sports Meet on January 11. It is really heartening to see a senior brother guiding his younger ones. May I ask you what has been your inspiration to do this year after year even after Bhagawan left His physical form? Srinidhi: The inspiration is very simple: the education I got here has directly been instrumental in me getting into the Armed Forces. 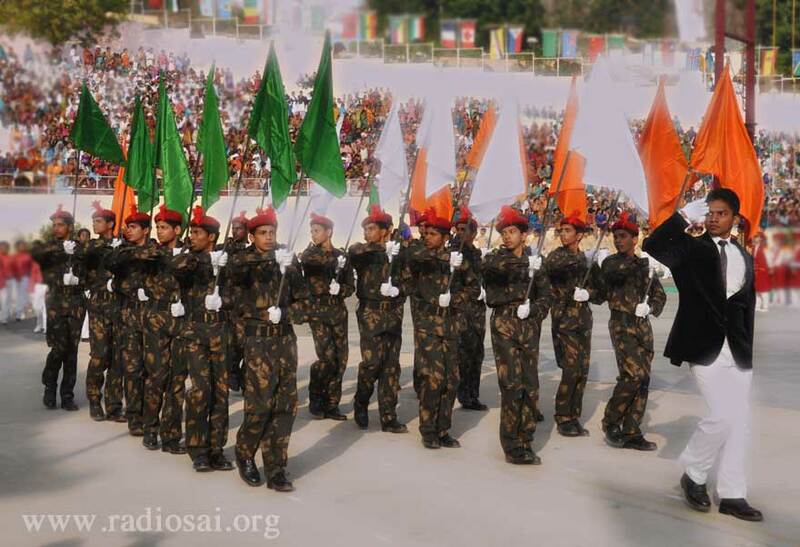 It might be a little surprising for a few people but what Swami has established, believe me, is a military academy with a tinge of spirituality. Barring the few prayer sessions and a few other things, the kind of discipline and group-loving that is instituted in the military academy and here, is the same. Swami has just brought in that. BP: Group dynamics with love. But Swami didn't show interest. Then they thought Swami is probably looking to reduce the budget and so asked if two in a room would do. But Swami was not satisfied; He wanted 11 boys in a room with each student having a window, a cupboard and a chair for himself. This is how our hostel has been built. Let me tell you this: Eleven boys living together in a hostel room and helping each other is a great thing. This is precisely what is tested in the military selection procedure – how well you gel with people. We are actually put into a place where we are 11 to 15 people. We are evaluated secretly in a very indirect manner on various parameters – our behaviour, how we feel for others, how we help others, and so on. These are the things I didn't know I was being evaluated on but I just cleared. BP: Those things are there in you naturally. Srinidhi: Naturally, because Swami wanted the boys to learn how to adjust with the other person and how to love; this is only one of the things. There are so many other things this institute has given me which I have learnt incrementally day by day. That has been instrumental for me to get into this great service. So it's my give-back time and I want to give as much as possible. That's why I come back year after year. In the initial few years I could not do it but once I got this chance I didn't want to leave it. This is one way I can give back what the Institute has given me. As far as Bhagawan leaving physically is concerned, I think it's immaterial because what He has given us is with us. Now we have to come and give back to the Institute. We have to look at it as the Institute rather than Swami. The Institute is what Swami has established. That has been my feeling. That's why I am coming again and again. BP: Wonderful, but why March Past? You can contribute to the University in so many other ways. Srinidhi: Yes there are many ways but the March Past is my forte where I have actually evolved. For joining the services this is one beautiful thing I've learnt. But the most important is that March Past is what Swami loved. Many people will be surprised and even shocked but I have physical evidence of this. Swami continued to come and see the rehearsals of the March Past till the last year of His physical existence; only in 2011 He could not come. Irrespective of His physical limitations He always took time out to come and watch. BP: That's true. Swami may or may not see any item or a particular stunt in the programme but He would definitely watch the March Past rehearsals every year. Srinidhi: It's a big thing to sit through the whole rehearsal. BP: In fact it could be actually boring for someone to sit through everything. Srinidhi: Absolutely! Parents who come will see where their son or daughter is marching and once that is over they will probably switch off. BP: But as you very rightly said Swami would always sit and see every squad. Srinidhi: He would comment and this is more important. Sitting and watching is different but commenting means He is closely watching and not just witnessing. You witness or watch a movie but close observation demands much more and Swami did that. In fact there are a few photographs of Sports Meet rehearsal and you can see that the attention of the people behind is elsewhere but Swami's concentration is on the event. This is how much importance He gave to March Past and I think He had His reasons, because the March Past is one item which gives many things to the people involved. They may not be aware but unconsciously it brings in a few things. One is the confidence with which you walk, which we otherwise would not know. Generally we put our head down and walk but when you walk out in the world a different walk is required. BP: Chest up and walk with a steady gait. BP: It straightens your body. Srinidhi: Confidence is built inside you. A few people walk straight but the confidence in their eyes is something different. This confidence is built in for individuals. In military it is called as ‘esprit de corps’ or ‘love for the group’. How this is built up is simple; it happens by thinking together. Together you will start achieving great things. When marching happens, the first thing happens is that you start thinking together. You think only two things – left, right, left, right; with that the thinking is on and all the 50 are thinking the same way. With that there is something building up. If 1 plus 1 is more than 2, 50 of them together is certainly more than 50. That's why during the war times they say “Don't catch me civilians but catch me one solider; he is equal to 100 civilians.” That is the kind of power that builds up when people grow together, think together and walk together. BP: So when students march you have seen all these virtues being inculcated in them? BP: Perhaps when we were doing that as students we never realised all this. Srinidhi: I never realised but this was being built in. I came to know this after going through the academy. In fact there is a force which builds up and it is seen. If you recollect on the days when there are riots in some cities, the police arrive and what they do is called ‘Flag March’. They just march on in the main streets. They don’t fire a bullet but just the way they walk creates fear in rioteers. The rioteers may be 100s or 1000s but this disciplined group of 50 can pack us down. This message goes just by marching. BP: Because they are marching together? Srinidhi: Yes. They are thinking together and with that confidence they are walking together and digging their heels. That power is seen. With that the riot comes under control. BP: They are perceived as a very formidable force. Srinidhi: Yes. Here we are being built into a formidable force. We are not 1000s and lakhs as a group and we are not being prepared for a war but whatever task we are doing that potential is maximised by walking together and thinking together. These are the few aspects which get into your personality once you do the March Past. With regard to your question about why I want to come back and do the March Past, I feel it is one of the biggest things I can contribute to. The individuals gain confidence and learn how to build up the potential of a group together. If I can contribute to it, nothing like it. That's my joy. Srinidhi: It demands sweat but sweating is my pleasure (laughs). BP: Especially in these times it is not easy because this is one of those periods in Prasanthi Nilayam when it is very cold in the mornings. Srinidhi: I make the people remove their jackets and sweat with their T-shirts. BP: Yes but it really needs that push to shake off that laziness and whatever is affecting you from outside. Once you start doing, your body warms up and everything is fine. So now that you have been doing this for so many years tell me what has been your experience of training our boys? 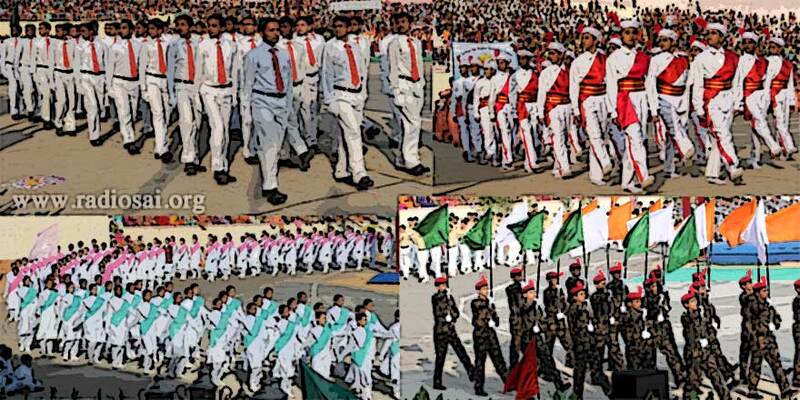 What is your perception of the quality of our marching? How are our boys doing? You were a student but after that for almost 14–15 years now you have been in the Armed Forces. You have trained and participated and also groomed and directed professional performances. Srinidhi: There's no doubt that our students do a great job though I won't hesitate to say there is a gap between a performance like the Republic Day parade and ours. But we must understand we are not directly into that. Swami's intention here is to develop individuals and their discipline. March Past is not a show piece for us. BP: Just like soldiers do it in the Republic Day parade in New Delhi. Srinidhi: There people are selected for the task and since morning 4.30 till evening 6.30 with a few gaps in between they do only this for months. We are not doing such an intensive training but given the fact that we have only 15 hours of training from Christmas to Sports Day or only 10 hours if you lose some training sessions, it's a great performance. Whatever students perform I would attribute it to two reasons. One is the students' love for Swami. What we are told is, “Do it for Swami.” So it is driven by love. Another is Swami’s grace. If we take 1 step He takes 10 steps. We have seen enough experiences and it continues to happen. 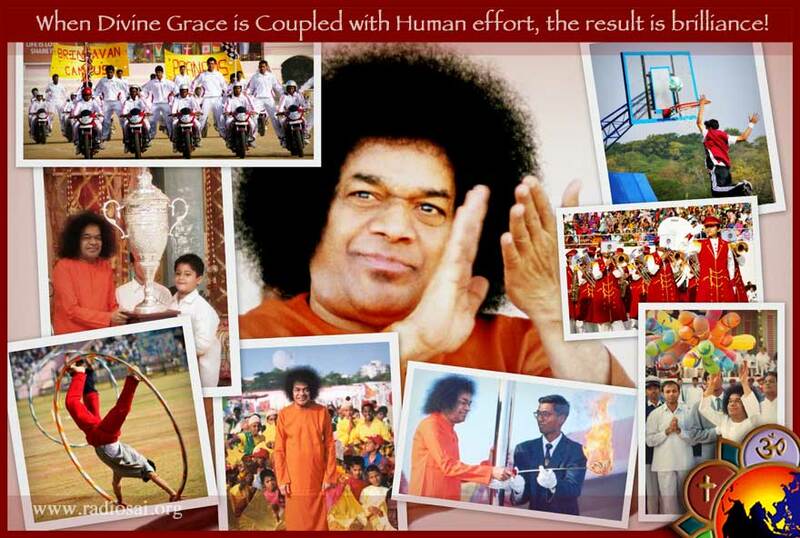 Every year the Sports Meet used to be an experience for us on how Swami’s grace works. The blockage was from our side to take initiative. If we take initiative things will happen. So when boys do anything with love for Swami, His grace flows and the marching standard does really come up. That way, students do a great job. There is scope for improvement but as a group of individuals with multiple talents like singers and great academic performers, March Past brings them together and to this standard. BP: Swami was very particular about that. Srinidhi: Now I understand why Swami laid so much emphasis on the March Past. That is the very important part of the training here and so Swami didn't want anybody to go out of that. BP: So you are saying it is students' effort but coupled with divine grace. Srinidhi: Yes. Both of them work and I see it year after year. BP: Wonderful. Srinidhi, you were saying there have been times when you have seen how divine grace works. Can you recollect anything from your student days, may not be March Past but any instance when you thought “This happened only because of divine grace”? Srinidhi: There are many instances but one stands out. It was during 1995. That was probably the first time that the Brindavan Campus thought of doing bike stunts. I did not know how to ride a bike but I was very good at acrobatics and so I did a few acrobatics on the bike and between the bikes. After the initial presentation on the Christmas day we were called to the field. Srinidhi: A small presentation on what all is done and what all is likely. BP: By people from the military? BP: They were just showing the different feats you can do. Srinidhi: He said, “We all have one broken bone minimum inside the body.” We said, “We just don't have that time. This is the task and we have to do it.” Then he said, “Okay start.” As we started things started picking up and by January 6th or 7th we were doing almost 80% of the stunts. BP: They must have been really surprised! Srinidhi: Yes. I don’t know how much divinity they felt in Puttaparthi but they were certainly impressed by our performance. If the same students are given for them to train, they would like to come again and again because they feel that the result is so quick. BP: They were saying they themselves take 6 months and here you have boys doing it in 15 days. Srinidhi: Swami’s grace flows, no doubt. It is a fact. BP: Fantastic! 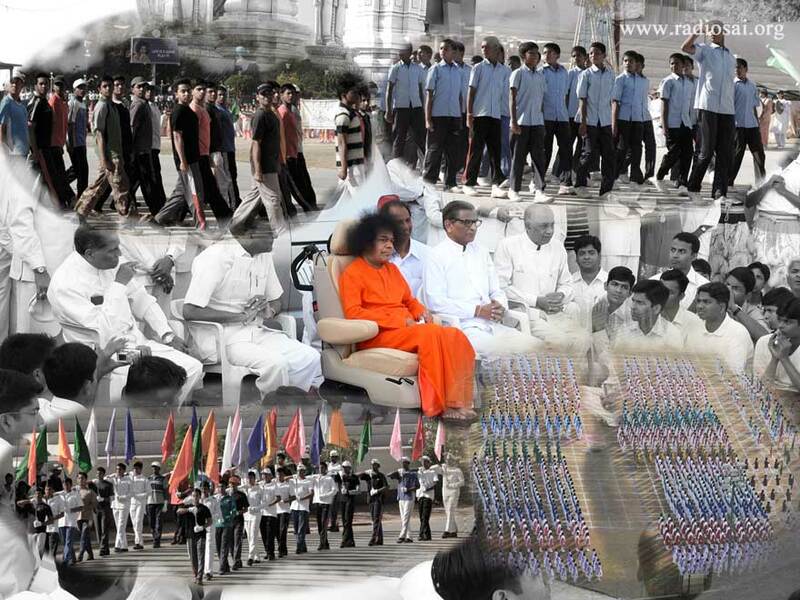 After you started coming every year for training students for the March Past, were you there on any occasion when Bhagawan was physically watching the rehearsals? Srinidhi: Yes I have been really fortunate. I would treat it as the pinnacle of my professional career. In 2009 Swami came twice on January 5th and 7th. On January 5th He saw the events but again He came on January 7th though He was physically not that well. On January 5th when He came He sat outside and saw the event practice but on January 7th He sat inside the car and asked the March Past to begin. He sat through the whole March Past practice in front of Shanti Vedika; He sat down, inside the car. Once the practice was over He called for the instructors. There were a few people from the army and a retired army person. I was also there. We all went and Swami spoke to us. He said, “The gap between the two squads should always be equal.” He was looking at a much larger view than just individual squads. BP: He was looking at the March Past performance as a whole. BP: So that the people watching from the stage are all the time occupied. Srinidhi: Yes, He couldn’t point out there because everything is happening and you can’t actually stop. But He had registered the boys who had not done well and whatever they didn’t do together or if they bent their elbows or knees. During the evening darshan He told them, “You have been noted for not doing the way you are supposed to do March Past.” So there is no doubt in the fact that it was very close to His heart. He wanted every boy to do it and gain whatever this activity has to give and carry it for life. BP: And now when you reflect more and more you know how important March Past is. Srinidhi: Certainly! I am very happy I am teaching this to the students because this is something closest to Swami's heart. Swami used to go to the college and teach, and He has taken a few classes for different subjects. But one thing He continued till the end is only March Past. BP: Yes. Swami used to always enquire whether the March Past session has started or not. Srinidhi: Yes. He was impatient to come and see. Srinidhi: I’m very happy to be a part of this. BP: Srinidhi, you are contributing so much now to the college in your own way and coming every year. Can I ask you what is it that you are taking from this place now? Is this place giving you anything now? Srinidhi: This place has given so much and I am still digesting what it has given 15 years back. It is only give-back time for me. Of course the place certainly has things to give. Every time I come I hear some stories or somebody's experience and it just gives me that awesome feeling of saying “Wow! Swami used to do this.” That's the great thing. Of course Swami is felt now but then sometimes tears roll from your eyes as you are sitting. Place-wise there is no doubt this is the place where I have grown up and my personality has been shaped. If the lessons come I am happy to carry them but I would love to contribute to this place in whatever way I can. BP: Wonderful! You are someone who is in the Armed Forces and are contributing to the country’s defence capabilities in your own way. So your love for the motherland and love for the Divine Mother are both going on simultaneously. It is such a heartening feeling. Srinidhi: Thanks to Swami for giving a place where I can do both. BP: Yes and we really marched past! Srinidhi: Yes we have flown past. We have done a fly past over the march past. Srinidhi: Thanks for inviting me. Sai Ram. What do you think about this Article? Please let us know by writing in to [email protected] or you may leave your thoughts in the comments section. Do not forget to mention your name and country.